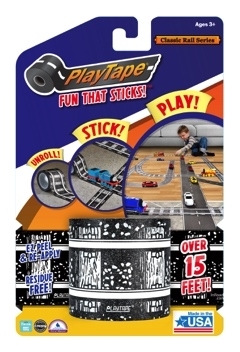 Printed to look like a railroad track, PlayTape Classic Rail Series is a roll of removable tape that’s perfect for playing with toy trains. 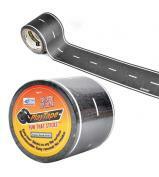 PlayTape Classic Rail Series is directly to-scale compatible with these most common wooden train tracks. 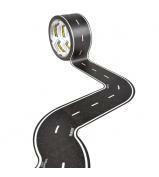 PlayTape is the fastest way to lay down rails for imaginative play, display, or decoration. Make instant train tracks, anytime, anywhere! PlayTape has been specifically designed to bring hours of imaginative entertainment at minimal cost and maximal convenience. 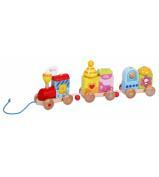 Use the toy trains you already have to ride on PlayTape. Use the blocks and toy buildings you already have to build a town through which PlayTape rail traffic flows. Create places real or imaginary. The possibilities are as endless as the Trans-Siberian Railway.